HOW COLLEGE HAS BECOME A RACKET! I recently highlighted the STUDENT SERVITUDE SHAM operating in America but since then our continuing investigation (which I will summarize below) has forced us to more appropriately label it a “racket”! We define “racket” as a business activity which is misleading, not fully “above board” and takes advantage of those less able or informed to take care of themselves. A “Racket” may or may not be illegal depending on whether our well lobbied legislators have the incentive to make it such. That said, the harshness of the term pretty well summarizes the $140B/ Year Student Loan, Finance & Servicing industry in America, which like an Iceberg is mostly hidden, below the surface. With student loans now totaling $1.4T this means that an additional 10% of that sum is being grafted annually from unsuspecting students and parents. There has been an endless amount written in the last decade about the exploding size of the $1.4 Trillion of student loans outstanding . College tuition and expenses has risen at a financially devastating rate for students and their financially trapped families. What few however can answer satisfactorily is: Why has this occurred? We can see from the chart below that this debt inducing juggernaut began gaining momentum in the mid 1990’s but then mysteriously exploded in 2010-2011. What happened in the early part of this post financial crisis decade? Certainly students didn’t suddenly start wanting to go to college? College operating costs on the other hand didn’t abruptly get more expensive? 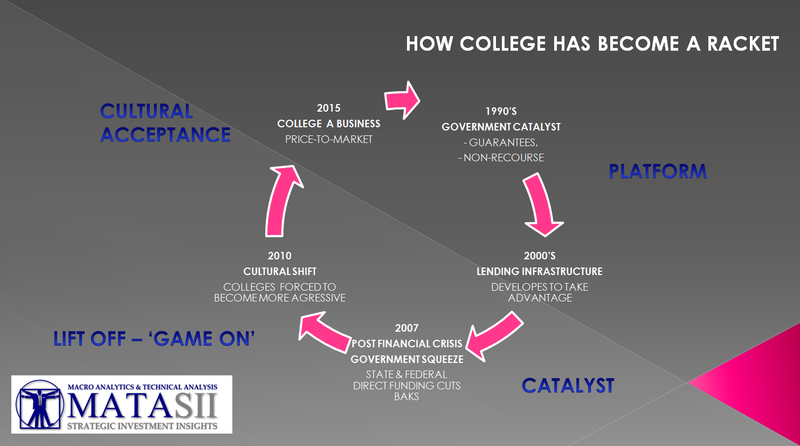 To understand the Student Debt Super Nova — Post-2010, we need to understand it in the context of a series of ongoing lift-off stages similar to a rocket launch, each stage accelerating the rocket upward towards a well planned trajectory. The banking lobbyist pulled off the biggest heist in history by having student loans made fully Non-Recourse loans, not dis-chargeable in bankruptcy court and open to debt garnishment procedures. 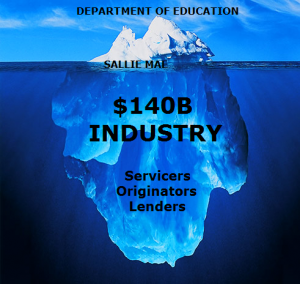 Sallie Mae was privatized and was then allowed to operate without government oversight and constraints to become much more aggressive and highly creative and innovative in its approaches to making student loans available. To the ‘money lenders’ this was a dream opportunity! An opportunity for “risk free” lending that needed to be fully capitalized on before the magnitude of the mistake was fully appreciated and consumer protection laws changed. Like the housing bubble prior to 2007, financial players quickly emerged to grease the skids of easy money and student credit. The $140B industry spun off fees, commissions, interest payments for all manner of services and financing. The explosion in SLABS made CMBS, Auto ABS’, and MBS’ seem like the slow-lane of finance, after all these older vehicles actually carried risk. Major players grew rapidly keeping low profiles and attracting little public awareness. We explore all this and more in a 44 minute video presentation which can be found here. Through Government Guarantees and Non-Recourse Loans, the government and students carry all the loan risk. 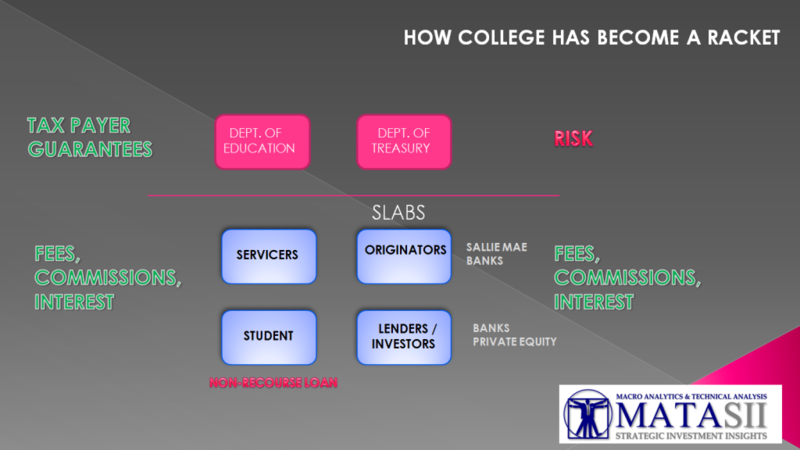 Lending by definition comes with some risk but through effective lobbying this has been removed within the student lending industry. This ‘risk-less lending’ phenomenon is likely a historic first for lenders which will inevitably come home to roost for US tax payers. We learned during the Housing Bubble and Financial Crisis that when loans are packaged, sold and then are no longer held by the originators, then the opportunities for abuse increases significantly. It is seldom identified until the bubble bursts and an investigative light is shown upon it. The bigger the profits; the more unregulated the opportunity; the less educated the lenders and the more the perceived the demand for the product; — the more the opportunities for corruption. When money is lent and the terms are irrelevant of whether it can be economically justified, then a loan is unsound. Though for example degrees in Engineering, Medicine, Computer Science have a much higher probability of being repaid compared to a degrees in liberal arts, this is not a consideration in whether a loan is granted and guaranteed by the tax payers elected government. 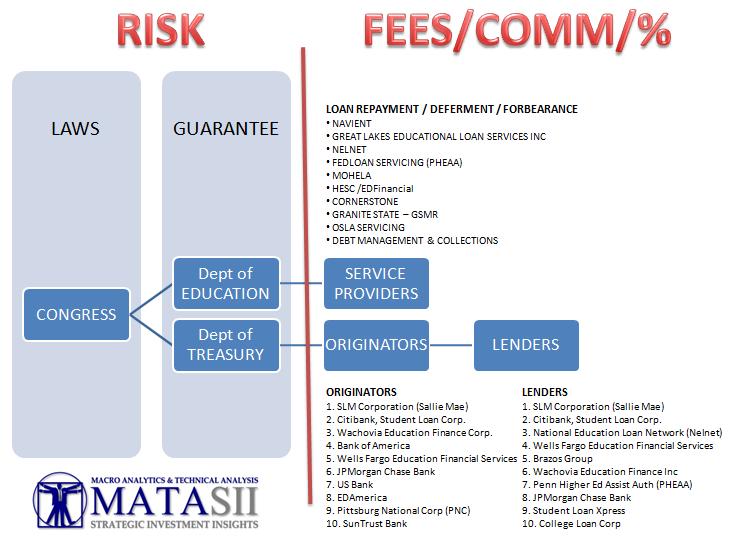 The student loan guarantee structure by design and via successful lobbying doesn’t differentiate “value” versus “cost”. It is immoral to have our youth assume a “non-recourse”, non-bankruptcy discharge-able loan without having the experience and maturity to understand the risk and obligations that come with it. Desperate for a possible “future” our youth are unwittingly being forced to assume a loan type that no company, organization or investor would ever assume. No lawyer would advise it. Little effective education is being given to student and parents on how risks are to be properly undertaken and receive professional counseled on whether the risks involved should in fact be assumed. 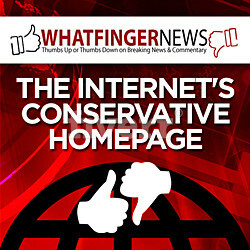 Consumer protection enforcement guidelines have been blatantly omitted. There is no honest, unbiased counselor in the lending process. There are only short term profit motivations. We need to stress that we are not suggesting anything illegal or nefarious is occurring in the Student Loan Industry. We would suggest that lending and servicing practices must be more tightly regulated and much stronger Consumer Protection laws quickly put in place to protect our youth from the destructive ravages of the soon to emerge – ‘unscrupulous’ debt collectors.